Wild Goose Lake Resort provides you with a great northern experience with all its beauty and adventure. Nature graciously provides beautiful surroundings for leisurely walks or vigorous hiking expeditions. We have miles of rivers and la kes that you can paddle down or across. In many of the places you can go, it will be only you and the serenity there. If you do decide to take one of these peaceful excursions, have a camera ready for you could see eagles, osprey, blue herons, moose, bear or timber wolves. We have over 500 feet of beautiful sand beach and sparkling clean water. A great place for the family to play or just relax and enjoy the water lapping on the shore and melt the stress and worries away. For 2019, we are exclusively focusing on the Namewaminikan River. 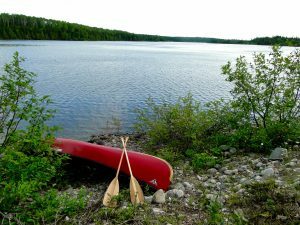 This canoe route offers both a relaxing excursion for the beginner and a challenge for the more advanced canoeist. Along this historically significant fur trade route you can experience the power of the river navigating chutes and whitewater rapids or you can opt to use overland portages and view these from the shoreline. Either way, you will get the full experience of being in the heart of the Canadian Shield regardless of your experience level and come away with memories that will last a lifetime. All trips start at Wild Goose Lake Resort where you will spend an afternoon on orientation, going over maps, equipment and general instruction. You will spend the night in one of our lakefront cottages and be ready to depart on your trip the next morning. You can choose a package where you will paddle from two to seven days and finish your trip back at the resort for a home cooked meal, hot shower and evening of relaxation. 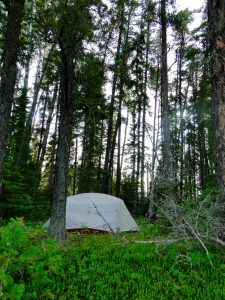 All packages included fully outfitted canoes, camping gear and 3 meals/2 snacks per day. A full list of gear will be attached. Call for info on Packages and Pricing! Head out on Wild Goose Lake for great fishing without a lot of traffic. If you are looking for more options, we have a great network of lakes that can provide you with a great fishing experience. You let us know what you are looking for and we can help you find it!